1. Sieve almond meal and icing sugar into a mixing bowl. 2. Beat the egg whites using an electrical mixer at high speed slowly reducing to medium speed. Add in the sugar while the mixer is at medium speed, beat until stiff. 3. Fold the meringue in with dry sieved ingredients. The mixture should be shiny. This could be tricky, too much folding will make the batter runny, less will make it hard, you have to check on what will work best as others suggest 50 folds, others; 60. 4. Put batter in a piping bag with a plain tip. Pipe onto pre-drawn rounds and leave them out to form a skin. This may take a while, others suggest an hour or two while others say 4-5 hours would be best. This method makes the shell develop “feet” and a lovely, shiny skin. 5. Make filling by beating butter with electric mixer until light and fluffy. Add lemon juice and zest; continue beating. Gradually add sugar, one cup at a time, beating well on medium speed. Scrape sides and bottom of bowl often. 6. 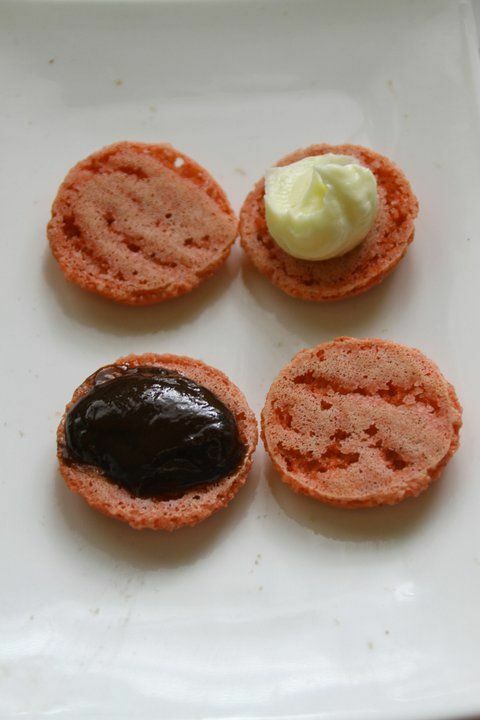 Preheat oven to 140°, bake macaron shells for approximately 10-12 minutes. Turning tray after 5 minutes to even out. Take them out to cool. When totally cooled, sandwich two shells together with the filling. Refrigerate before serving. For other flavors, you may put in a few grams (about 8gr) of raspberry, cherry or strawberry powder plus a few drops of red food colouring to the batter. Above is cherry with cream cheese (ja, we love cream cheese!). This batch did develop feet but were not us pretty as the yellow ones. I guess 1 hour leaving them was too short. She certainly loves macarons too. Parang difficult to make! 😀 Cute ni A, she really seems eager to eat! 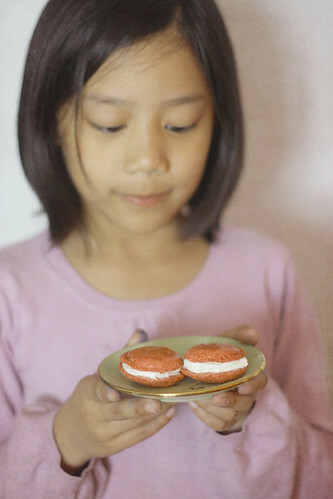 I just had macarons yesterday and was thinking about making my own, too. I agree with MommyandMatt, they look like hard to make, but I’d love to take on that challenge! Hehehehe. Thanks for sharing! Great job on your first try! 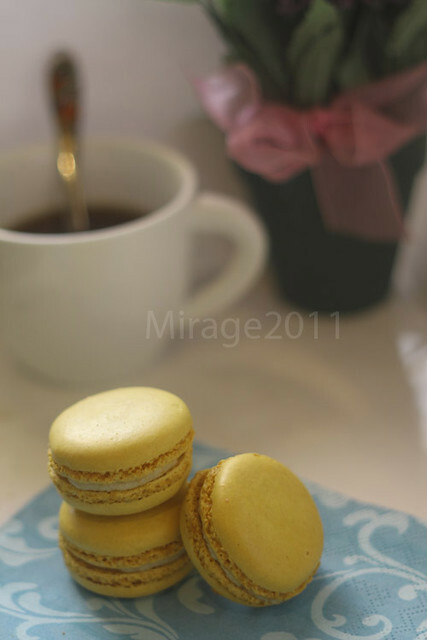 I’ve yet to try making macarons (definitely scared! ), but hope to do so soon! Yum! I can’t make them out of fear that I’ll fail! Hi I located your webpage by mistake when i searched Yahoo for this concern, I need to tell you your page is truly helpful I also enjoy the style, it is beautiful! That looks great. Good job on the macarons.